Joyce Glasser reviews A United Kingdom (November 25, 2016) Cert 12, 111 min. With Belle, Writer/Director Amma Asante’s exposed a shameful slice of Britain’s history that was so particular and compelling, you couldn’t have invented it. The story had noble, courageous characters who fought against racial injustice and a euphoric climax that left us all smiling despite all the atrocities and injustice described in the film. 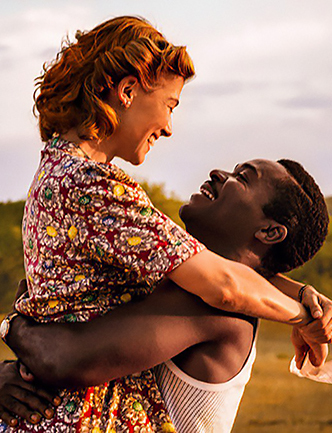 Now Asante has done it again, basing A United Kingdom on the taboo romance between Ruth Williams (Rosamund Pike), a white, insurance company typist from London and Sir Seretse Khama (David Oyelowo), the tribal heir to the throne of modern day Botswana. The film, shot on location in Botswana and London, looks great and Asante directs her talented actors with competence. But this is a case of the story pretty much telling itself, albeit in a way that accentuates the clichés and hurries through the historic points without bringing alive the extraordinary central relationship. After meeting at a school missionary dance in 1947 and going on a few dates where they gradually bond over jazz music, Ruth Williams (Pike) falls madly in love with a 26-year-old Oxford law student named Seretse (Oyelowo). 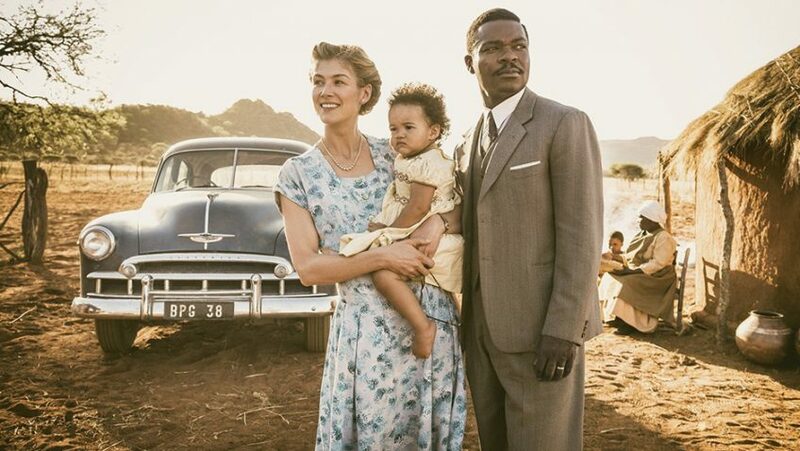 Even if Seretse could have stayed in the UK, an interracial marriage in 1947 would not have been easy, but the lives of the star-crossed lovers are complicated when Seretse reveals that he is heir to the throne of Bechuanaland. Moreover, his conservative uncle and acting Regent, Tshekedi Khama (Vusi Kunene) is eager for Seretse to return and adamant that he marry an appropriate native woman. The lovers were not expecting smooth sailing to the then-British protectorate of Bechuanaland, but they did not foresee the dirty tricks of an unholy alliance of self-interest between a UK clinging to its empire after WWII and desperate for cheap minerals, and mineral rich South Africa itself, a country about to introduce Apartheid. Once Seretse proposes (with a symbolic Big Ben in the background like an omen of the weight of tradition on their shoulders), the film becomes an obstacle course, beginning, of course, with Ruth’s father (Nicholas Lyndhurst) who threatens to disown her. This scene feels like a cliché even though it really happened. Seretse’s uncle Tshekedi (Vusi Kunene), a stickler for tradition and wary of upsetting the UK government, is even more of a thorn in Seretse’s side than in real life. In a rip-rousing, get-your-hankie-out scene, the initially hostile tribe elects Seretse after hearing his powerful speech (the great Oyelowo, who played Martin Luther King in the excellent film Selma is quite an orator). In the film Tshekedi hangs around to cause trouble, but in reality, he left the country in disgrace once his nephew was elected (after two rejections). The biggest obstacle is the mighty Blighty, represented by obnoxious and supercilious local governor Rufus Lancaster (Tom Felton) and super-smooth and sleazy London-based diplomat Sir Alastair Canning (Jack Davenport) – neither of whom really existed. Canning explains to Ruth what Apartheid is, and why her timing is particularly bad. South Africa, the UK’s indispensible ally, is about to be formally and legally segregated, a practice that, as we will see, has already spread to Bechuanaland and embarrasses Seretse as it disgusts his bride. When the government tricks Seretse into coming to London for talks and then refuses to allow him to return, his cause his taken up by a young Tony Benn (Jack Lowden), who really did exist and became even closer to the Khama family than the film has time to let on. We are told, however, but only indirectly, about Churchill’s shockingly hypocritical u-turn when he was re-elected, extending Seretse’s exile indefinitely. Much is made of the spousal separation, which only lasted a few months as the Khamas lived together in the UK from 1951 until 1956. Although not mentioned in the film it was apparently the Queen, upon reading a heartfelt appeal from Khama’s people, who granted him the right to return, albeit not as leader. It was this status that led Seretse to create a democracy and run for President. Asante does a good job of contrasting a grey, rainy post-war London and the warm, sunny and vibrantly colourful, British Protectorate and in spanning nearly two decades with subtle period detail. But while we feel the courage of the two lovers, it’s much harder to be convinced of their chemistry. There are no love scenes, but even the scenes of physical intimacy seem awkward and strained. Pike is a typical English Rose renown for playing high class women and even a Bond girl, so it could be we are conditioned to thinking of her as such. Her job as an actress, however, is to make us believe that she is a typist who lives with her conservative father inside a claustrophobic brick workers’ cottage, and we never do. The historic short hand and fictional villains are perhaps to be expected in an historic drama spanning two decades, but the real shame is that we only learn about Ruth’s accomplishments in the end captions. During the film Pike excels at being a fish-out-of-water in Botswana valiantly enduring a local maternity ward and rolling up her sleeves to become one of the girls, but we never see the feisty, brave and humble woman who worked tirelessly for her adoptive country (she outlived Seretse by 22 years). It is the power of the story, and the photographs of the real couple and their children, that ultimately sweep aside the film’s shortcomings and win you over.